Many games have presented a vision of the zombie apocalypse. Resident Evil tasks you with surviving the outbreak using weapons, Dead Rising lets you unleash hell using novelty items in Malls and Left 4 Dead puts four heavily armed characters together and requires co-operation for success. But few have focused so heavily on the human side of this subject as much as Telltale’s first season of The Walking Dead. It asks you to make incredibly hard decisions across five episodes of zombie-hell, and may even draw a tear. While some foibles prevent true excellence, you’ll find a great adventure series here. The Walking Dead places you in the shoes of Lee Everett across its five episodes. As he is being driven to jail after being convicted of murder, a car crash seemingly grants him freedom. But to his horror, hundreds of zombies converge on his position. While fleeing, he runs into a young girl called Clementine. He feels it is his duty to protect this young girl and help her to safety. Along the way, they meet dozens of characters including a family from Fort Lauderdale, a news reporter and even a homeless man. The constant snippets of the relationship between Everett and Clementine are incredibly human and emotional and the individual stories of each character you meet are usually very engaging. You start to grow a genuine sense of attachment towards even the less pleasant characters you confront, which makes the grim nature of every episode all the more upsetting. TWD is different from other zombie games, in that the focus is chiefly on the human interaction rather than the living-dead. You’ll very rarely engage with zombies for the most part, which actually heightens the terror of their presence. Much of TWD is spent conversing, as the game uses a Mass Effect-style dialogue choice system. Unlike ME, however, many of the decisions you make cannot be comfortably categorised as good or bad. More often than not, the consequences of even the tiniest word choice will have repercussions further down the line, and more often than not your decisions will upset at least one person. This is particularly notable during the first three episodes, where you’ll have to decide, for example, who gets food rations and who will go without. The lack of moral clarity which comes with each decision is unlike anything before, and it also lends itself to a high level of replay value as you shuffle through the multitude of outcomes. There is a sense of linearity to it all though, with main events occurring no matter how you choose to act. What does change is how characters interact with you throughout each episode. The unpredictable nature of TWD means you can side with a character who then dies shortly afterwards, leaving you with someone who remembers you siding with the deceased figure. And because you grow attached to everyone, it can make you feel genuinely guilty. That’s why TWD is so impressive: its human characters extract every kind of emotion from the player; whether it’s happiness for their accomplishments, anger for their misguided actions or sadness when tragedy occurs. I will confess the ending caused me to shed tears, and that makes TWD stand-out from its peers. TWD’s first three episodes are absolutely killer. A New Day allows us to begin investing in these characters while throwing moral curveballs and hard decisions thick and fast. Starved for Help is the highlight, demonstrating how humans can become more monstrous than the zombies themselves. It features even harder decisions at a frequent rate, and though the plotline mostly apes the comics – which remove some of the surprise for fans – most will likely be left shocked by what transpires. Long Road Ahead keeps the troubles coming as more decisions are thrown at you, along with multiple moments of emotional tragedy which make it the most sombre episode by far. Unfortunately, Around Every Corner is hugely disappointing, introducing mostly-bland new characters and containing more of a focus on combat and less on difficult decision-making. Thankfully, though not as strong as episodes 1-3, No Time Left provides a fittingly emotional conclusion which will satisfy, even if its gameplay isn’t as engaging at this point. It should be noted that this is less of a game and more of an interactive movie-style experience, as most of the gameplay is pretty simplistic. 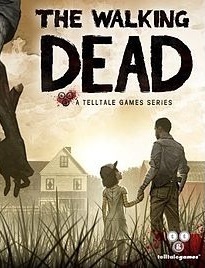 An adventure game at its heart, Telltale have taken elements of the genre and simplified them. Puzzles appear sporadically throughout the game, but they usually become scavenger hunts as you scramble to find whatever triggers the next event. Everett can move through static environments, but a picky camera and weird movement can dampen these sections. Combat mostly comes in the form of Quick Time Events, and naturally these aren’t particularly difficult. Some sections allow you to aim and shoot, but these too are very forgiving. And TWD feels less successful when it puts you in these action scenarios, removing some of the zombie terror. TWD is also held back by a lack of visual polish. The art style is solid, with a look that mostly stays faithful to the comic-books and is pretty pleasant, while character’s have emotive facial expressions which make growing attached to them easier. It’s not as technically-sharp as it could be though, with a lot of rougher details sticking out on characters such as blurry clothing. More frustrating are the frequent hiccups, as long pauses punctuating certain scenes and frame-jumps are all too common. However, an incredible sound production does alleviate this issue. Voice acting is simply spot-on, with each actor giving a superb performance in a majority of the scenes. And the script itself feels very human and engaging. Sound effects ring through sharp, especially loud gunfire and the shambling zombies themselves, while music into each situation perfectly. To some, The Walking Dead may seem shallow and technically flawed. It’s definitely not the kind of zombie-game most will be used to, with very little in the way of action compared to the likes of Left 4 Dead. But that’s exactly what makes Telltale’s latest adventure so special. A sharp focus on its characters, each of whom leave a lasting impression, rises TWD above its contemporaries, while an excellent script and great voice-work brings each character to life. This all, perhaps masochistically, contributes to the raw emotions you feel, especially considering the generally grim tone of each episode. This is not for the fainthearted: what you experience will cause you to feel sad, uncomfortable and sometimes emotionally wrecked. But it’s a game that pulls you in, and won’t let go until long after you finish playing, and even if TWD may not be the sharpest gameplay experience to date, it’s certainly among the most emotionally poignant.